Compare property websites Realestate.com.au and Domain on their ease of site navigation, range of properties, quality of information available, image accuracy, tools and calculators, as well as overall satisfaction. Realestate.com.au has edged out rival Domain in Canstar Blue’s 2018 review of the two biggest Australian property websites. Browsing online property websites is a guilty-pleasure for many, as the ability to view that fancy house in the next suburb over from the comfort of your own couch can be too good to resist. Whether it’s for styling tips, to get a feel for the housing market, or simply quench your curiosity, online real estate sites are a handy tool for many Australians. When it comes down to which online property site to use when browsing, by far the biggest players are Realestate.com.au and Domain, both offering similar services, including articles regarding the housing market and calculators to evaluate properties. 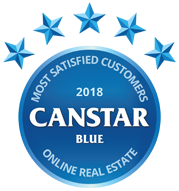 To find out which website Aussies prefer, Canstar Blue sought the opinions of more than 600 users. Realestate.com.au offers a variety of services, regardless of what type of property you’re looking for, or your budget. With listings available for those looking to buy, sell, rent or even invest, Realestate.com.au has become one of the ‘go to’ sites for Aussies in the market for a new place to live, or new tenants to live in their home. Part of the REA Group, a publicly listed company on the Australian Stock Exchange, realestate.com.au is majority owned by News Corp Australia, with subsidiaries and expansions covering property markets in China, Malaysia, Singapore, Thailand and India, with partnerships covering all types of property. Realestate.com.au allows consumers to search for all types of properties, including houses, apartments, villas and acreage in addition to retirement villages and commercial properties. If you’re simply looking for a room, Realestate.com.au has linked up with Flatmates.com.au to give consumers a wider range of properties to choose from. Additional extras include articles and blogs on all things housing, as well as helpful tools such as a home loan calculator and a renovator estimator for potentials costs. Another handy feature for those interested, or seeing what the house down the road sold for, is the Auction Results section, which allows consumers to see prices and house information on recent sales. To help with your decision to sell, Realestate.com.au can also give you a market analysis of your area, including median house prices and annual growth statistics to help make sure you’re comfortable with your final decision. Realestate.com.au does not have prices listed for those looking to advertise their property, but has a request process to help get the ball rolling. If you’re keen on just browsing, Realestate.com.au offers a ‘Lifestyle’ section, allowing visitors interested in interior design or those looking for inspiration for their own homes to browse all the latest trends and styles. Domain has emerged as the biggest rival to Realestate.com.au, also becoming something of a one stop shop for Aussies interested in buying, selling or renting a new home. Domain also allows users to search for recently sold properties in their area, as well as search for commercial properties and share houses. Founded and majority owned by Fairfax Media, Domain is a publically listed company and part of group that includes other property ventures, such as Domain Rural, Commercial Real Estate, APM Pricefinder and Review Property. For those looking to gain a bit more knowledge on the housing market, Domain also offers a variety of articles and blog posts about recent market changes, as well as tips and tricks to help you secure a loan or what to expect when buying or selling. Additional extras include an option to find a local real estate agent in your area, as well as the Home Price Guide, which gives users an approximate pricing for their home based on their address and surrounding housing prices. For those interested, Domain also offers an Auction Results section, which shows the results of recent auctions. This feature works hand-in-hand with Domain’s Suburb Profile section, which gives consumers pricing and demographic information on particular suburbs, allowing those keen on moving to suss out who their neighbours might be, as well as information on local schools and transport options. Additionally, Domain also provides the ‘Domain Loan Finder’ and ‘Domain Insure’ for those looking to secure a home loan or home insurance for their property, through a third-party lender. Which online property website do Aussies like best? For the casual user, it might not make much difference which website you choose to go with, especially if you simply use it as a means of procrastination or inspiration. But for homeowners looking to sell, or a first-time buyer, the site you choose could make a big difference, especially when it comes to the cost of listing a property. Similarly to buying a house, it’s best to shop around to find the best fit for your needs and budget, as you may be only a few clicks away from finding the perfect fit for you. Canstar Blue commissioned Colmar Brunton to survey 3,000 Australian adults across a range of categories to measure and track customer satisfaction. The outcomes reported are the results from customers within the survey group who have used an online real estate service in the last twelve months and made a subsequent action – in this case, 651 people.